In the deepest part of the ocean, unexplored by man and too deep for humans to swim, lives a little sea creature named Gillbert. Gillbert the Sea Creature is the son of KING NAUTICUS, king of all the oceans. One day, Gillbert will be king. But in the meantime, his playful curiosity takes him away from the kingdom on a journey of discovery. 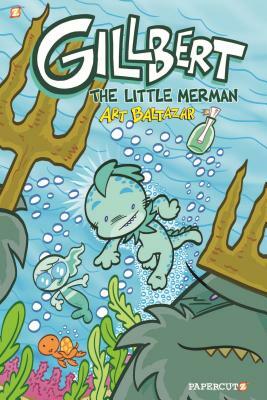 Gillbert meets an amphibious mermaid and follows her into unknown parts of the ocean. Where he meets many unknown and undiscovered species of underwater creatures. He didn’t know these things existed so close to home. Gillbert’s world just got a whole lot bigger! Art is a super-cartoonist machine from the heart of Chicago! Artie is a creative force behind The Eisner Award winning ITTY BITTY HELLBOY and The New York Times Best Selling, Eisner Award, Harvey Award Winning DC Comics' TINY TITANS, and Artist of The DC SUPER-PETS children’s book series! Artie also Co-Wrote DC’s Billy Batson and the Magic of SHAZAM, Young Justice, Green Lantern Animated (comic) and is the Artist/Co-Writer for the historically awesome TINY TITANS/Little ARCHIE ?crossover and the epics SUPERMAN FAMILY ADVENTURES and the new SUPER POWERS! Series from DC comics. Recently, he became co-Founder of the AW YEAH COMICS comic shop and co-Creator of the AW YEAH COMICS comic book series starring ACTION CAT and ADVENTURE BUG!